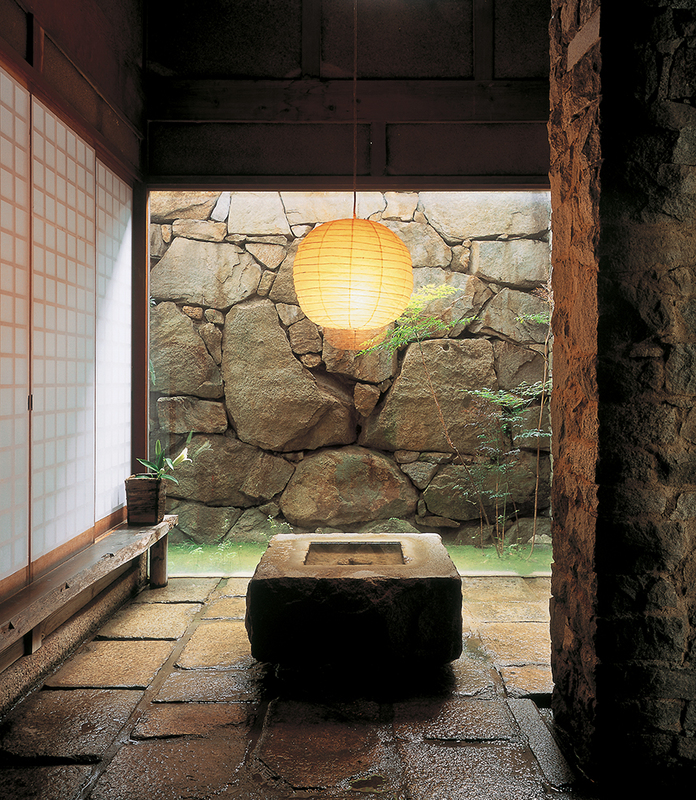 Water and stone are two essential elements of Izumiya, a remarkable house constructed in 1972. This twentieth-century house features two timeless issues in Japanese design: the quests to express the innate beauty of natural materials and to bring the interior and exterior closer together. 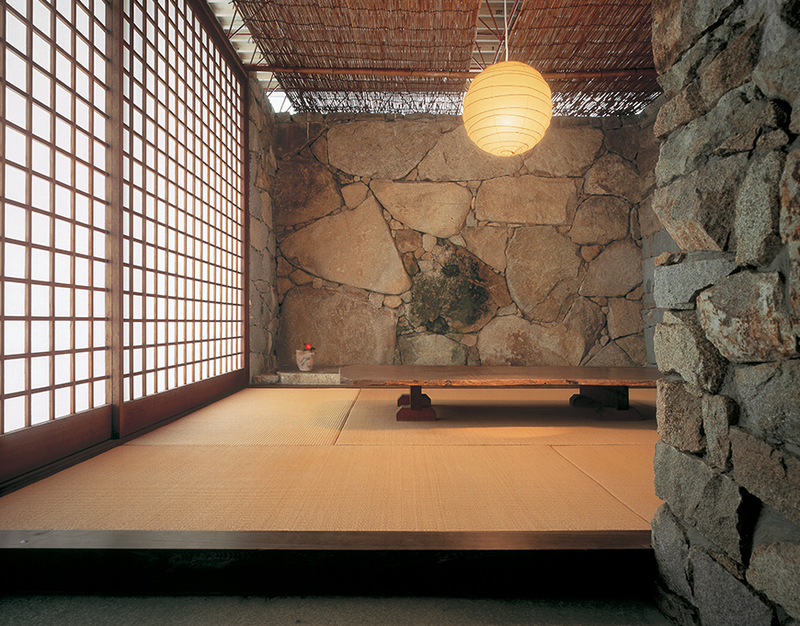 These goals have been achieved in this house by using traditional materials such as stones, shoji screens, timber floors and tatami mats in a radically different way than in traditional Japanese architecture. This home highlights the innate beauty of stones. The designer seeks to create forms where the soul of each stone is expressed in as natural a way as possible, and believes that one must handle a stone created by natural forces over thousands of years with great humility. The ground floor of this 267-square-meter house is composed of massive stone masonry walls, a light steel space frame and roof, and an occasional reed ceiling. A continuous strip window below the ceiling level adds to the impression of airiness of the roof that contrasts with the heavy stonewalls below. Innovative use of stones of various shapes and colors in the walls, floors and artifacts has produced a powerful experience. The entire glass wall of the living room can be slid aside to open the room to the porch and the garden. A small second floor area has two tatami-matted bedrooms and a wooden truss, lending it a more traditional than the first floor. The central feature of the living room is a column constructed from two pieces of solid granite. Since stone looks best when it is wet, this column, the rough ashlar stone floor, stone alcoves, and other stone objects of this room are watered every day. 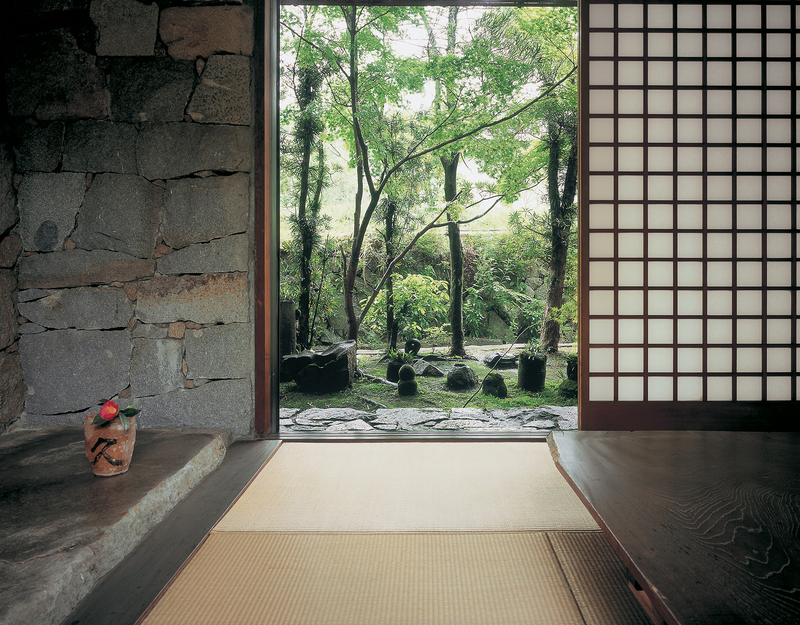 As this is common practice in Japanese gardens, the effect of this in Izumiya is the blurring of the distinction between inside and outside. Indoor plants that grow out of the stone crevices further reinforce that concept. This article was published in the March 2016 issue of Inspire Living Magazine. Download it here!